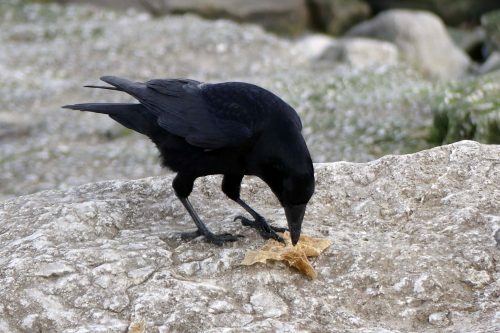 Historically, the Carrion Crow Corvus corone, is one of our most maligned and persecuted birds and the species continues to sustain losses at the hand, or gun, of man. 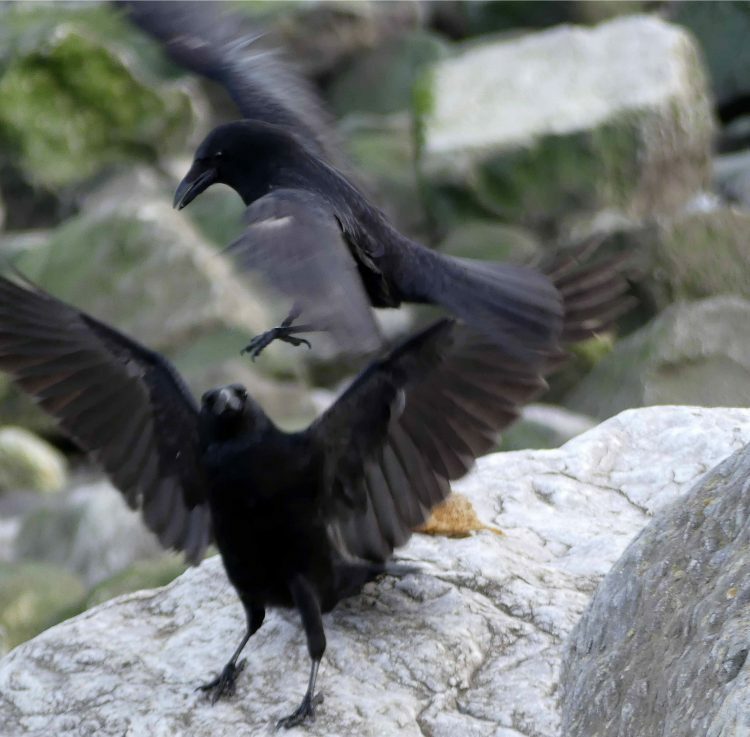 But as one of the cleverest and most adaptable of our birds they continue to thrive despite us. 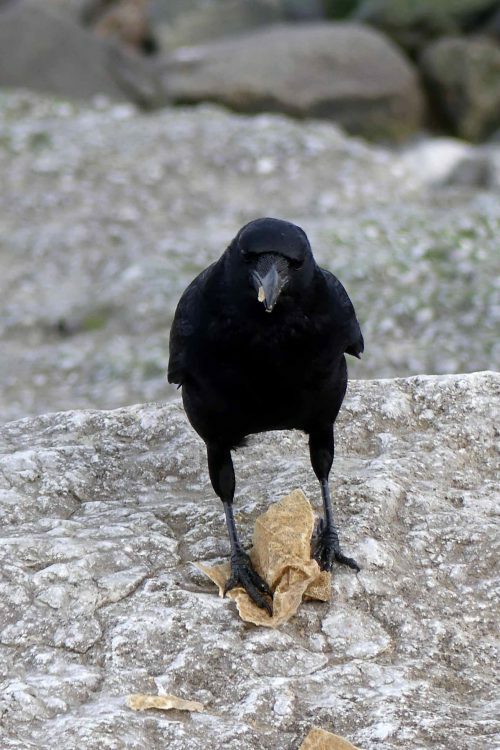 And in common with other resourceful species dependent on their wits and equipped for scavenging, many can be found taking full advantage of our amenities and messy lifestyles. 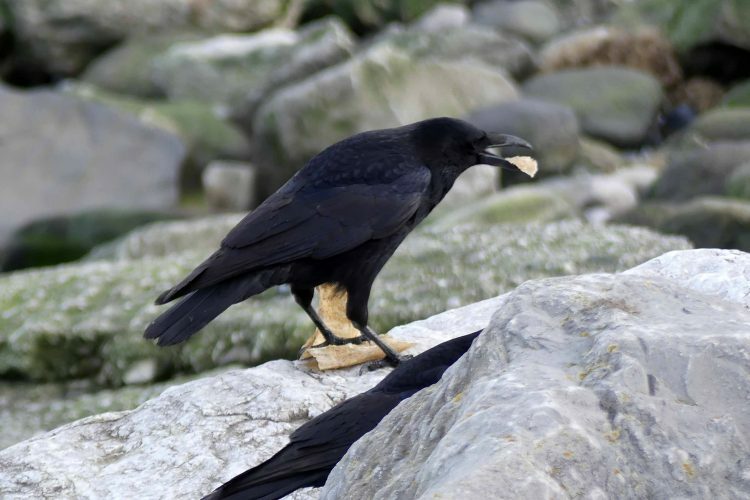 I was reminded of that on a recent walk along the Prom at Rhos on Sea where the rocky shoreline and mussel bed are a regular foraging ground for Crows. 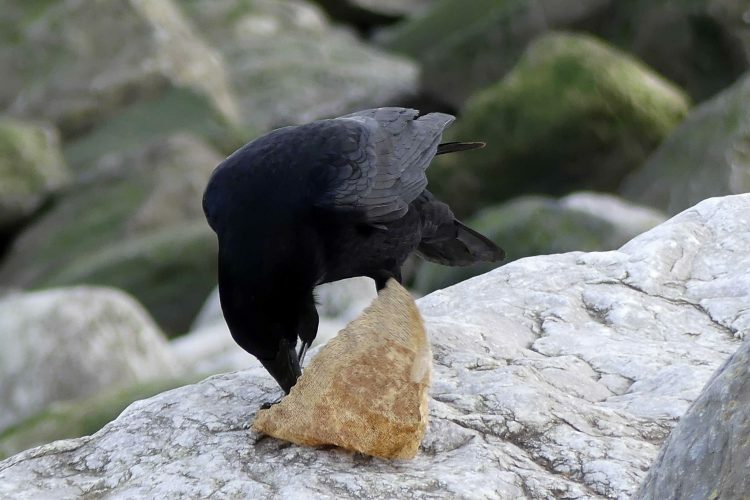 I noticed a Crow dropping what I assumed was a shellfish onto rocks still exposed by the incoming tide quite close-in below us. (Us being me and my 16 month old grandson snug in his buggy). I’ve watched this fascinating behaviour before, but this was the closest view I’d had. Fumbling for my camera with gloved hands whilst manipulating the pushchair meant I missed getting a shot of the final successful drop, but I was able to watch the bird tuck into his tasty mussel snack. 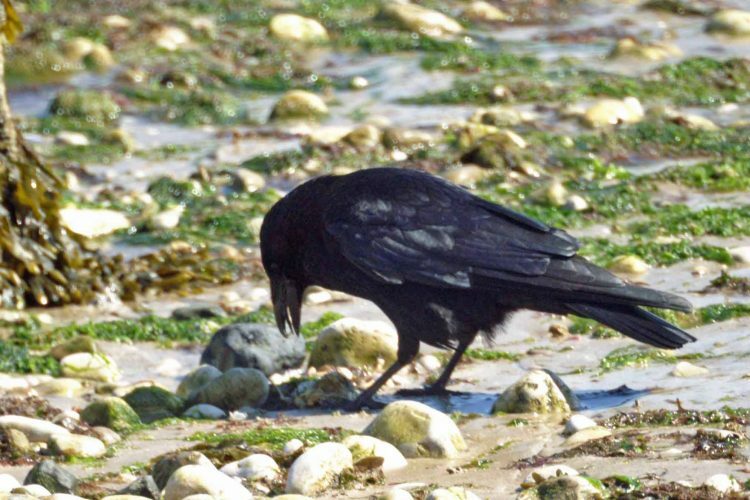 This was one of three Crows foraging along this rocky stretch, one of which was rummaging amongst the dry seaweed and debris collected on the strand line. 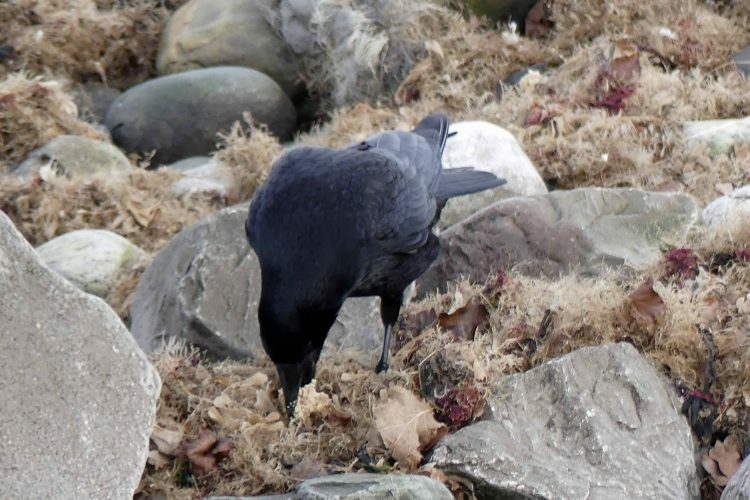 It was working hard to extricate something from amongst the seaweed debris then having tugged it loose, it carried it off to a large rock nearby. 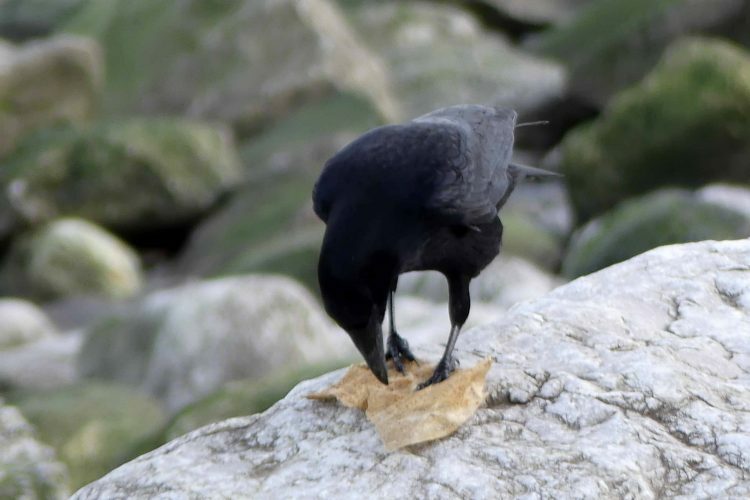 I couldn’t work out what on earth it was, but watching the bird tear off smallish pieces to eat, a piece of old, greasy chip paper came to mind! Even looking more closely at my photographs hasn’t enlightened me, so I’d be interested to hear anyone’s alternative suggestions. 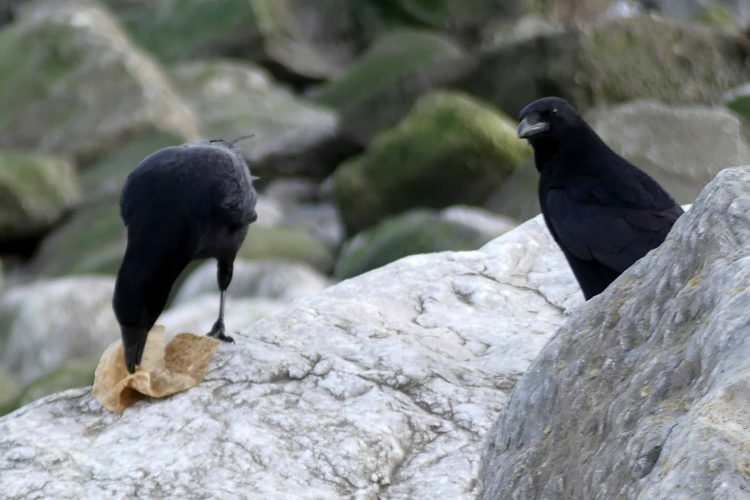 Whatever it was the Crow seemed more than happy with it, clamping it to the rock with its feet to make tearing easier. 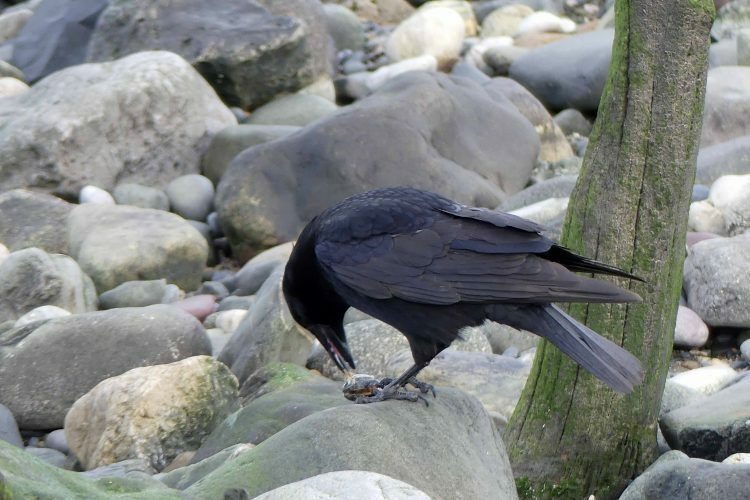 As I said earlier, there were three Crows foraging more or less together. They seem to be adolescent birds, so could well be siblings from last year’s brood produced by the resident local pair. 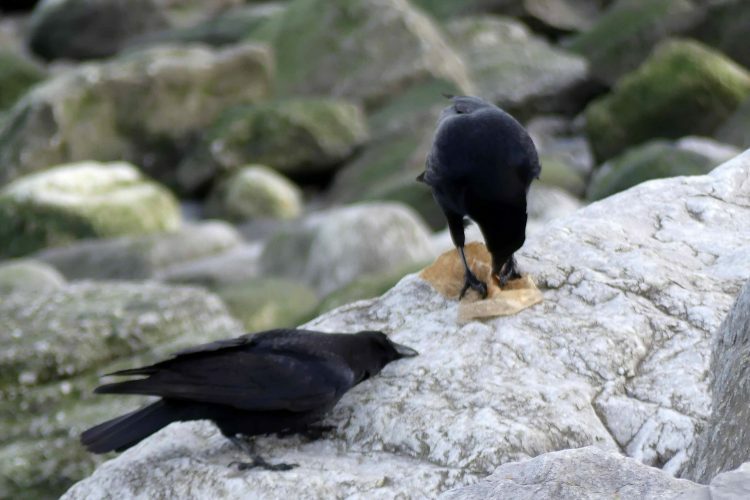 It wasn’t long before one of the others spotted the potential to share the bounty and, crouching low to the rock, tried to sneak in stealthily. Going in from the front clearly wasn’t the brightest idea, and it was soon sent packing. It didn’t give up and soon tried again, this time more assertively. That didn’t work either, it just made the feeder more annoyed and this time the would-be robber was dispatched with cawing and an aerial attack. Even that wasn’t enough to put it off though and it soon came back again, sneaking up from behind this time. 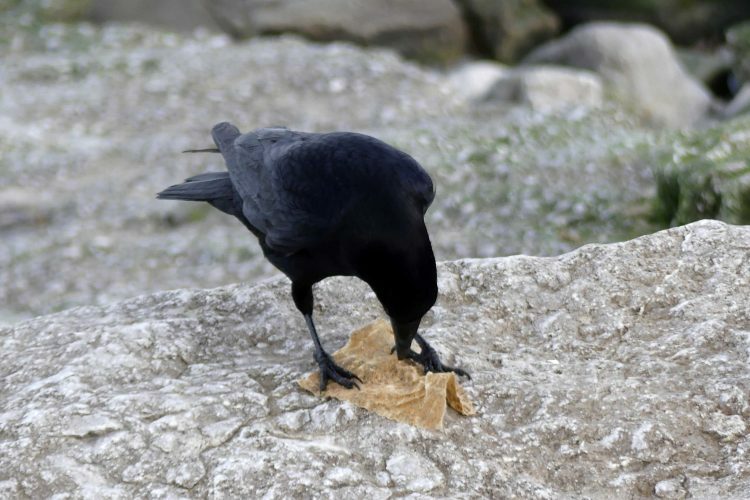 A determined lunge and a grab with its formidable beak finally secured it a piece of whatever-it-was and it fluttered off to a spot surprisingly close by to enjoy its stolen prize. I’m sure the snack was all the tastier for not having had to work for it. I thanked the birds for sharing their mealtime with me and left them to it.